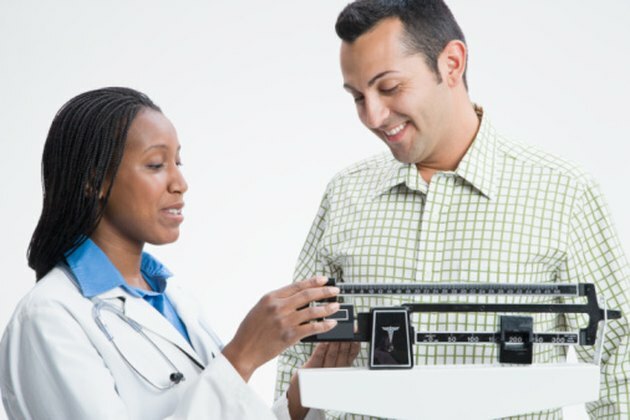 The standard for determining what is a man’s ideal weight has changed in recent years from insurance companies’ Weight-for-Height tables to Body Mass Index (BMI) tables that correlate height and weight with BMI. According to the National Heart, Lung, and Blood Institute, men should have a BMI between 18.5 and 25. You are underweight if your BMI is below 18.5, overweight if it’s 25 to 29.9 and obese if it’s above 30. A man who weighs 182 lbs. and is 70 inches tall has a 25.8 BMI. The W in W/H squared is 82.72, because 1 kg equals 2.2 lbs., and dividing 2.2 into 182 equals 82.72. The H is 1.79 m because 1 m equals 39.4 inches, and dividing 39.4 into 70 equals 1.79. The number 82.72 divided by 1.79 squared equals 25.8. The Centers for Disease Control and Prevention has a chart that informs men what their ideal weight is if they have a BMI between 18.5 and 25. If you’re a 6-foot man, your ideal weight is 137 to 185 lbs. Other ideal weights in pounds, with heights in parenthesis, include 101 to 135 (5-2), 104 to 140 (5-3), 108 to 145 (5-4), 111 to 150 (5-5), 114 to 155 (5-6), 117 to 160 (5-7), 121 to 165 (5-8), 125 to 170 (5-9), 129 to 175 (5-10), 133 to 180 (5-11), 141 to 190 (6-1), 145 to 195 (6-2), 149 to 200 (6-3) and 153 to 205 (6-4). The standard Weight-for-Height table was developed by the Metropolitan Life Insurance Company and is still used by many physicians. The table was based on statistics for longevity, although “The Well Adult” reports that people who weigh 10 to 20 percent less than the average weight live the longest. “Essentials for Health and Wellness” reports that healthy men weigh between 5 percent less and 20 percent more than the charts’ standards. The Metropolitan Life Insurance chart reports that a 6-foot man’s ideal weight is 148 to 158 pounds if his frame is small, 154 to 170 pounds if it’s medium and 164 to 184 pounds if it’s large. All numbers are based on wearing clothes, including shoes with 1-inch heels. Other ideal weights in pounds for medium-framed men, with heights in parenthesis, are 118 to 129 (5-2), 121 to 133 (5-3), 124 to 136 (5-4), 127 to 139 (5-5), 130 to 143 (5-6), 134 to 147 (5-7), 138 to 152 (5-8), 142 to 156 (5-9), 146 to 160 (5-10), 150 to 165 (5-11), 158 to 175 ( 6-1), 162 to 180 (6-2), 167 to 185 (6-3) and 172 to 190 (6-4). Ideal weights are about six to 12 pounds less if their frame is small, 10 to 14 pounds more if it’s large. People utilizing the Weight-for-Height tables frequently aren’t sure how to categorize their body frame. According to the University of South Carolina School of Medicine, you can determine your frame size by wrapping the fingers on one of your hands around the wrist of your other hand. You have a small frame if your thumb and middle finger overlap, a medium frame if they touch, and a large frame if they do not touch.